I remember a Boy Scout hut that was located on Guess Road in about the same location during the 1950's. Do you have any information on this? I wonder if the Hursey house would have survived the tornado that touched down on top of the Sears Auto Center? Seems like it was the early 1980's; some small photos of the devastation were in Newsweek* magazine. During that same storm, tornadoes skipped across north Durham. There was some damage to the old oak trees at the then-new Durham County General Hospital. The oaks were on the property when it was the "old folks' home." *That's where memory tells me they were. Heck, I'm not even sure it was in the 1980's. Could have been mid-1970's. If anyone has more definite memories, chime in. I seem to recall that the Hursey house was still there until the early 1970s (though I didn't know it's name.) The expansion of Northgate into that area and the Sears Auto Center were complete by about 1974 or 1975, so the house would have been torn down before then. Very cool! Of the three mentioned, only the Cole Couch House survives (my house). I know GK is planning to cover this soon, so let me just say in advance that yes, I know the yard needs to be mowed! I went to La. this spring to take care of my mother, and the folks to whom I rented the bottom floor did not live up to their promise to keep up the landscaping. Hopefully the folks I hired will get it done before Gary snaps a still. Oh, and Lynn is welcome to photograph the interior anytime! 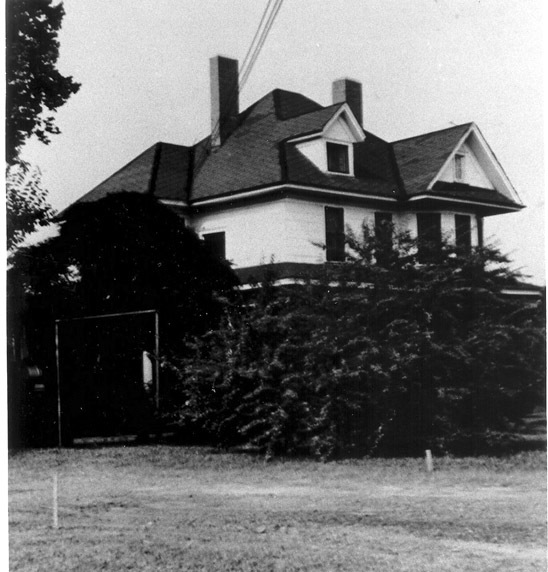 The tornado was in the mid-80's.It touched down along Iredell Street behind the main 9th Street shopping district where it blew out the windows of a friend's car (a 1984 model) and upended a large tree into the roof of one of the large houses on Iredell which stood where Melton's Garage is now situated. I can't remember the house being there although I must have driven past it many times. She must have left Golden Belt a few years before I worked there in 1964-65. Sure it wasn't too bad for her even as a lady in mgt., but as a menial laborer it was a horrid place to work, six days a week in the summer when you wanted some time off, and 3 day weeks in the cold winter when you needed the money. And bosses that thought slavery was still in effect. Another house I wish could have been saved however. This was the house I spent many happy hours in as a child. I was owned by my Grandfather's sister, Aunt Julie. She took care of the whole family during the depression. I think they moved in some time in the late 40's early 50's. The house was actually 4 strories, the basement (which wasnt totally finished but had a dirt floor and was rented out! ), the first floor where my grandparents lived with my mom's two younger sisters, and the second floor, where Aunt Julie, her sister, Aunt Victoria and Vic's daughter, husband, and 2 kids lived. The 'attic' or 4the floor was where my cousin's bedroom was. There was also a huge vegetable garden in the back yard which fed the families for many years. So multi-family was all the "rage" back then... :) My grandfather grew and sold tomatoes. There was a huge mulberry tree in the front yard. Wow, were they good! I remember being there as a 6yr old (1950) playing with my cousin who lived in the second floor. I have pictures of interior and of the family gathered on the front porch in their rocking chairs as we kids played in the front yard, if anyone is interested. I was distraught when I found out they were going to tear it down. Sorry I didnt see this sooner! I was about 5 years old in 1962 when my family moved to this area. We lived on the first house on the left on Forest Road where Sedgefield Street ends and Forest Road begins. Never understood why the same stretch of street had two names. I was too young to remember this house being there. Once Northgate was mentioned I recognized the area. Was the white gabled building surrounded by buildings on two sides where Mayola's Resturaunt was? I have vague memories of Mayola's. There was a 7/11 Convenience Store built across the street from the house, and what I think was Mayola's, in the early 1960's. Ever since I was a boy I had wondered about the street configuration in that area. With the aerial view photo above that now makes sense. The small white building in the lower part of the photo was reconstructed (or new built) into a Biscuitville many years ago. Possibly the early to mid 1970's. On my last trip to Durham a few weeks ago I saw that it was closed and empty. And the side street was closed off. I can remember the gas station on the left being there at least until the 1980's. And the small one across from Biscuitville was open until just a few years ago. (I think it is closed now.) There is also a small family cemetery in the area on the left of the aerial photo. I was looking for a clump of trees to indicate where it might be. I cannot find the link for the story now, but part of the land belonged to a former slave that bought land and had a farm there after the Civil War. Thanks to Sherry Handfinger for providing information and photos regarding her great aunt. 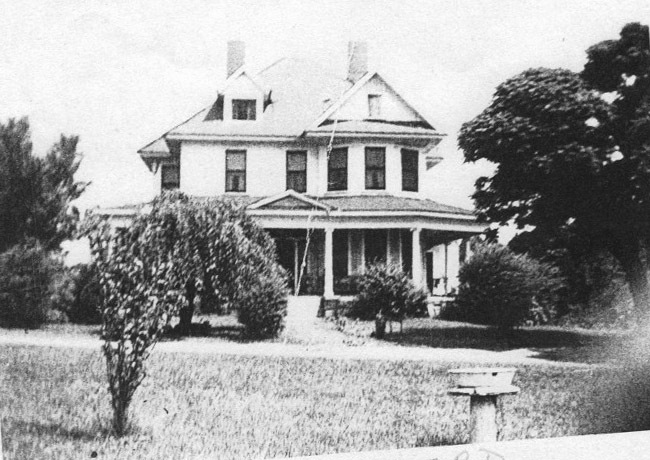 The Julia Hursey house stood at 1202 Guess Road; it was a fairly grand Victorian structure which clearly predated most structures around it in the photos below. Only the Cole Couch House and the DC May house on West Club at Norton St. were similar in size and detail when these structures were built in the first ~15 years of the 20th century. "[Julie] was born on May 30, 1895 in Montgomery County, NC, the 8th child of 12. Her large family eventually moved to Durham, NC where she worked at Golden Belt Manufacturing. Julie was a supervisor at Golden Belt.. [she] was not allowed to join the union there since she was part of management. At some point, she attended Bryn Mawr College in Philadelphia for a year. She worked at Golden Belt for over 50 years." Beryl Hursey Dabney, a niece to Julia Hursey, lived in the house with other family members while she attended Duke University. "The two-story house had a finished basement as well (making it 3 floors) that was rented out to tenants. There were many doors leading to the outside. One of the bedrooms had a large carved mantel around the fireplace… it was probably a dining room in earlier years. In the kitchen there were steps going up to the second floor." The house still existed during the initial construction of Northgate Mall, in its original strip center configuration. It appears that it was likely torn down during the 1970s. On the site currently stands the Sears Auto Center.